The weather here in Michigan cannot be more perfect and the yield from the earth cannot be more abundant! Tomatoes, basil and garlic are currently overflowing in gardens, markets, roadside stands and grocery stores. My husband and I took a spin over to the local farmers market to check it all out. After viewing the numerous stands of fresh produce, meats, poultry, fish, cheeses, eggs and pastries we decided to purchase ingredients for a fresh tomato sauce for dinner; quick, easy and refreshing! 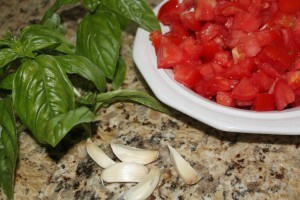 I picked out 3-4 large ripe tomatoes, a bunch of fresh basil and a fresh head of garlic (if you haven’t tried fresh organic garlic…the flavor is fabulous and it is worth every penny; for those of you who have, you know what I am talking about). I knew we had a chunk of fontinella cheese in the fridge and of course we always have enough olive oil and pasta in the pantry. After a pleasant glass of wine on the deck while enjoying the beautiful early evening and a chat with the neighbors; I was able to whip up a fabulous fresh tomato basil sauce within 30 minutes. The meal was perfect! Below is the recipe for this sauce. Feel free to peel the skin off the tomatoes before a course dice. I have found that fresh tomatoes early to mid-season (late July thru August) have a thin soft skin and not necessary to peel. 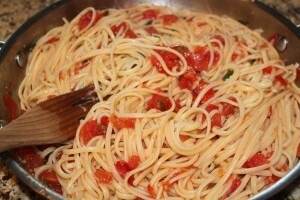 I also use a general garden variety tomato for this dish (not Roma/plum style). One more thing; DO NOT refrigerate your tomatoes; they will get mealy and lose a fair amount of flavor. If you happen to pass a produce stand on the way home from work or this week…stop and bring a bag of goodies home or better yet, make a special trip to the farmers market on saturday morning. You will not be disappointed! Warm olive oil in large sauté pan over medium heat. 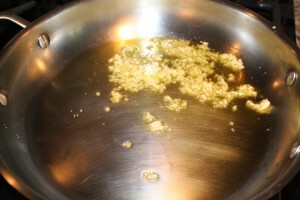 Saute garlic for about 30-45 seconds. Add diced tomatoes with any juices and basil. Bring to a simmer; continue to adjust heat until you see gentle simmering bubbles coming from sauce. Taste the sauce after about 5 minutes of simmering. Season with a large pinch of salt and some generous grinds of pepper; taste. Add more salt sparingly until you get the right balance. Only add a small pinch of sugar if necessary. You will know if sauce needs sugar if there is a sharp acidic/tart taste. Saute for about 20-25 minutes more or until you see the tomatoes begin to soften. Continue to adjust heat so the sauce stays juicy and does not dry out. 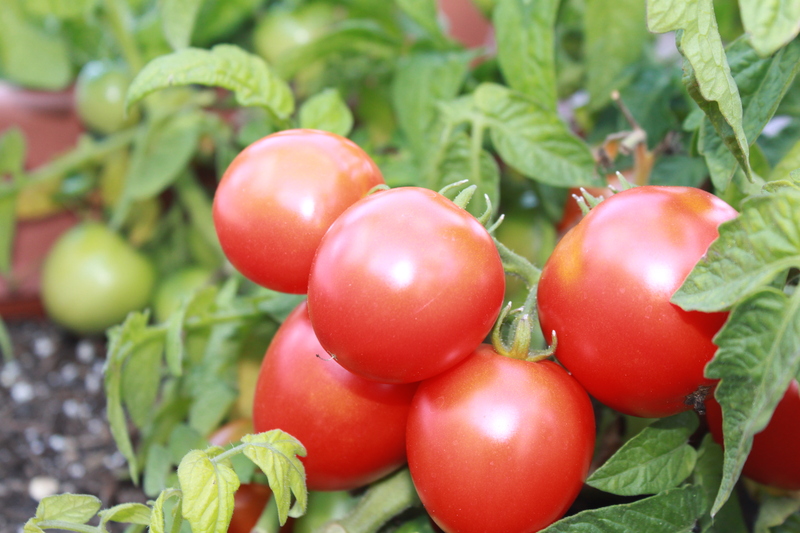 The moisture content in tomatoes varies from one variety to another as well as the time of season. If you find the sauce starting to dry out, just put a lid on the pan and reduce the heat.